Nemorino (Giuseppe Filianoti). Photo by Cory Weaver. 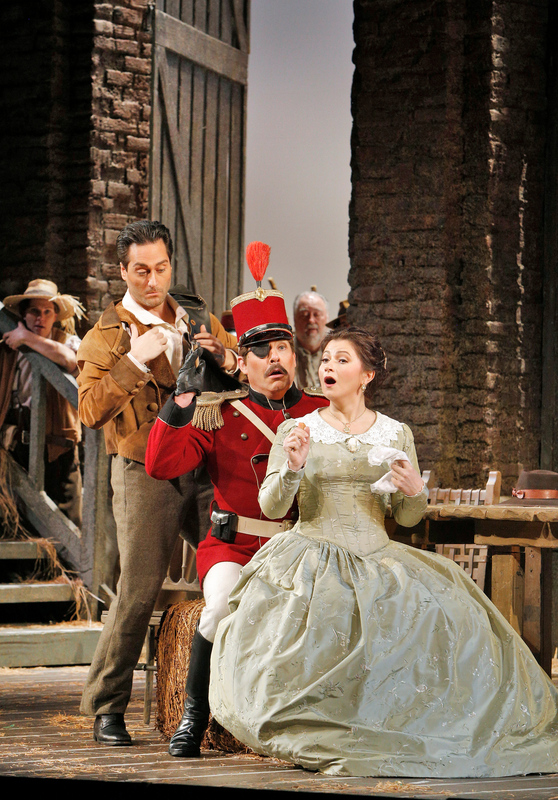 Few false notes in San Diego Opera’s freshly decanted Elixir. 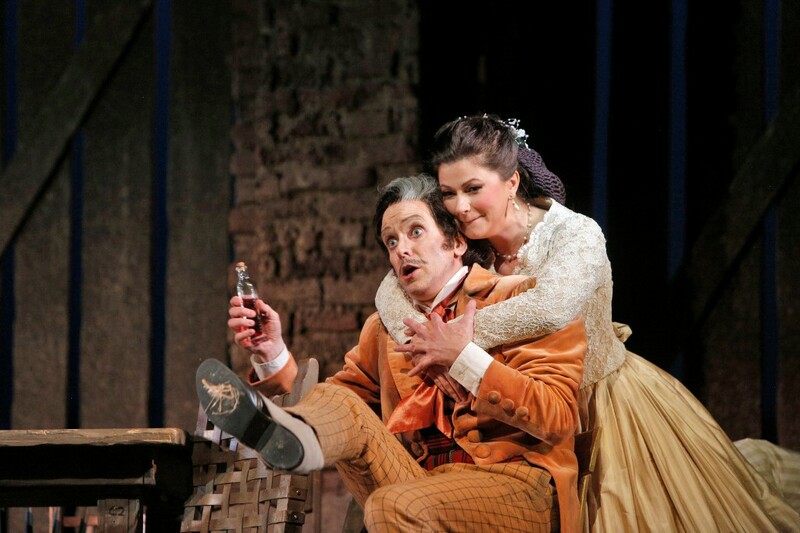 The old and jaded opera critic hardly looks forward to yet another Donizetti L’elisir d’amore, but it is, after all, a masterpiece, and when it is done well, it is thoroughly delightful. Everything about San Diego Opera’s The Elixir of Love, decanted for the first of four performances here last night in Civic Theater, was just about perfect. What problems there were will doubtlessly be a thing of the past as the brief run continues through February 23. Unless some of the world’s greatest singers could be resurrected from the grave or coaxed magically back to life out of the grooves of beloved phonograph records, the cast could hardly be bettered. Soprano Tatiana Lisnic is a charmer with a gorgeous flexible voice that promises at every moment it could tackle one of Donizetti’s famous operatic queens, not just a rustic farm girl like Adina. Fortunately, Donizetti — and this is truly one of his greatest achievements as a composer — can, in an instant, take his musical characterizations from the lightest comedy to the most sincerely expressed emotions of a deeper hue. And for this, Lisnic is fully in control. Tatiana Lisnic as Adina. Photo by Cory Weaver. One hopes Lisnic will come back to San Diego again and again from far-off Moldavia (land of her birth), but I imagine she will quickly be in demand everywhere and too expensive. 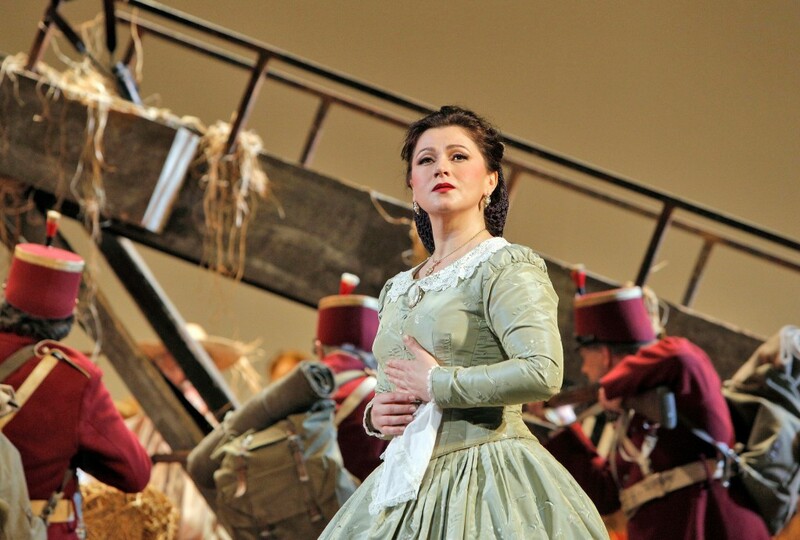 Ah — I recall when Anna Netrebko was — who? Somebody we had heard a few times at the San Francisco opera in something or other, and we thought we should tell people about her. Now she’s the Met’s reigning diva. 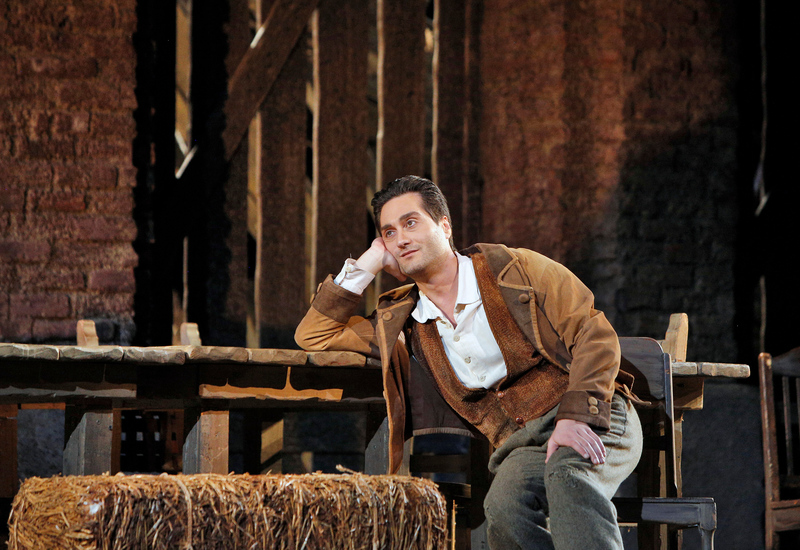 In any case, the peasant girl Adina, as conceived by the librettist Felice Romani, has something of a cruel streak about her, so her character is more than a two-dimensional stock figure. There’s a lot to work with in the part and much wonderful music, both frivolous and deeply touching. 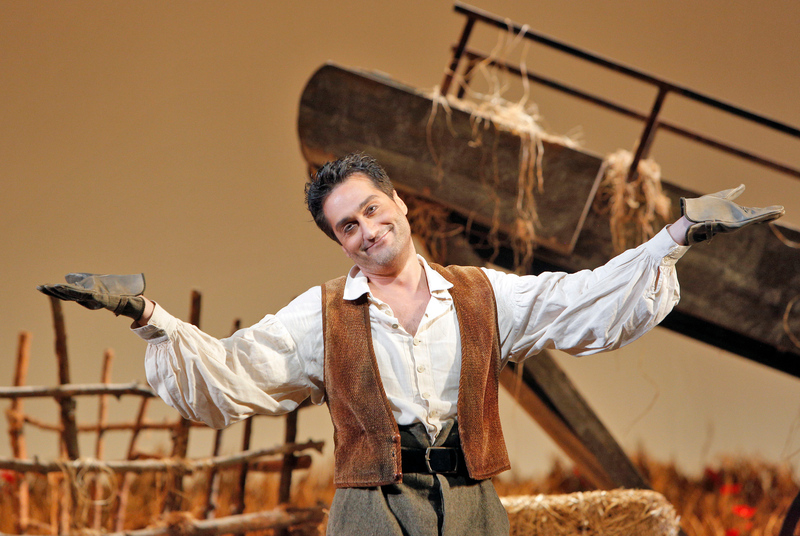 Adina relentlessly teases her love-besotted suitor, Nemorino, an endearing country hick who is played with slaphappy comic earnestness by tenor Giuseppe Filianoti, a young singer but already a veteran in this part. Nemorino (Filianoti). Photo by Cory Weaver. And what a part it is. No sooner is the curtain up than Nemorino is singing a beautiful cavatina, “Quanto è bella” — and as the part progresses, the music explores every sort of emotion. There’s the duet “Chiedi all’aura lusinghiera” in which Nemorino must try to fathom Adina’s indifference, and before long there is the sublime silliness of the effects of Dr. Dulcamara’s famous love potion, nothing more magical than a bottle of Bordeaux. But what seems like farce darkens in Nemorino’s “Adina, credimi,” a passage of great beauty that demands we take the ridiculous seriously. The “Venti scudi” passages are justly famous, as our hero contemplates enlistment as a way out of his problems. Eventually he will get both the girl and some money (an inheritance from his uncle), but not before singing one of the highlights of the entire tenor repertory, “Una furtiva lagrima,” a piece that brings the voices of Caruso, Pavarotti, Gigli (or fill in the blank) immediately to mind. Regrettably, Filianoti encountered problems with this golden moment, almost as if he were running out of steam. But this was the only egregious flaw in an engaging performance that had charmed the audience all evening long. Kevin Burdette (Dulcamara) and Tatiana Lisnic (Adina). Photo by Cory Weaver. The fraudulent traveling medicine salesman, Dr. Dulcamara, is a juicy buffo part, often played by a singer of some sizable girth, but trim American basso Kevin Burdette brought this role a fresh look and lots of fresh comic schtick, the latter, no doubt, in collaboration with director Stephen Lawless. When this opera was first produced in the 1830s, Dulcamara’s amusing patter songs were one of the show’s most popular draws. The lyrics are so witty, the music so busy and irresistible, it remains to this day one of the greatest roles of its kind. Burdette, sounding great, had wonderful fun with it and so did the audience. Lawless lavishes this show with lots of broad comic pantomime, and it threatens at first to be rather off-putting. But ultimately, with such a good cast acting silly, everything pulls merrily together. Elixir offers a wonderfully ludicrous love triangle, by the way. Sergeant Belcore, played and sung to perfection by American baritone Malcolm Mackenzie, is the “braggart soldier” of ancient Roman comedy, absurdly boastful of his prowess in love and war. He briefly seems to get Adina away from Nemorino, but nothing can avert the happy ending. His troops (not to mention the entire agrarian population) are the excellent San Diego Opera chorus under the direction of chorus master Charles F. Prestinari. The spirited San Diego Symphony contribution this time around was under the direction of American conductor Karen Kamensek, current music director of the Hamburg State Opera. Nemorino, Belcore and Adina. Photo by Cory Weaver. One wishes the part of the peasant girl, Giannetta, were a little larger than it is because it was a pleasure to hear American soprano Stephane Weiss singing it. She does get to preside over one of the opera’s more memorable comic scenes: the village girls have found out that Nemorino has suddenly become immensely wealthy, news that proves more effective than Dulcamara’s elixir when it comes to a magnetic attraction. Ultimately even Dulcamara himself thinks it’s his elixir and not the newfound wealth that has made Nemorino so irresistibly attractive. This production is simple and attractive. A huge grille, supposed to be the side of an Italian barn for the storage of grain, comes and goes and is a bit ungainly, but it adds visual variety. The fields of hay beyond are romantically attractive, especially in one moonlit scene. In the long run, the sets and costumes of Johan Engels provide a great amount of detail and a element of realism. Lighting designer Joan Sullivan Genthe did a fine job on a tricky project, although people too far upstage were occasionally obscured in gloom. Tatiana Linsic as Adina. Photo by Cpry Weaver. Readers are invited to leave comments below.